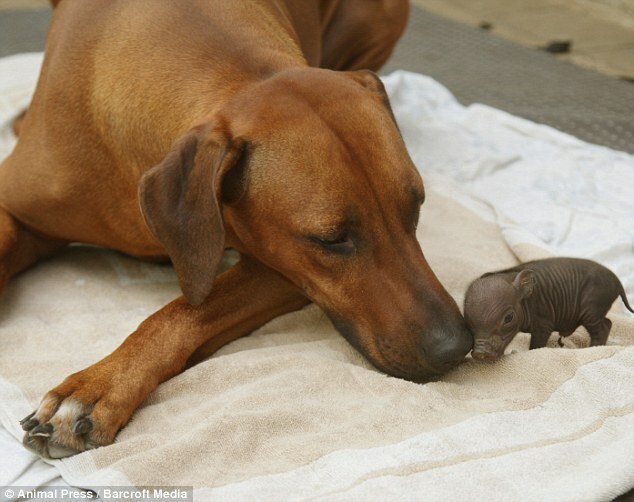 Surrogate mum Katjinga, an eight-year-old Rhodesian Ridgeback, took on motherly duties for grunter Paulinchen - a tiny pot-bellied pig - and seems to be taking the adoption in her stride. 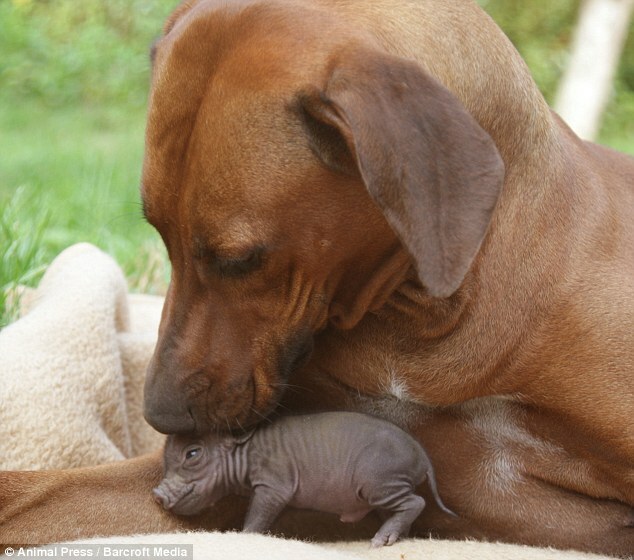 And the unlikely relationship has made the wrinkly piggy a genuine sausage dog. 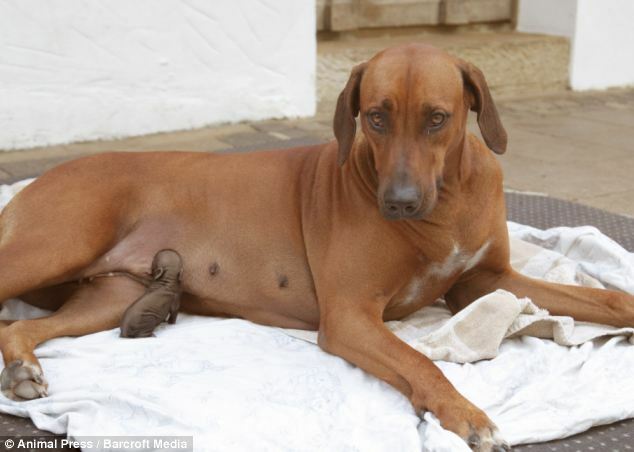 In these adorable images Paulinchen can even be seen trying to suckle from her gigantic new mum. The two animals live together on a huge 20-acre farm in Hoerstel, Germany, where Katjinga's owners Roland Adam, 54, and his wife Edit, 44, a bank worker, keep a pair of breeding Vietnamese pigs. 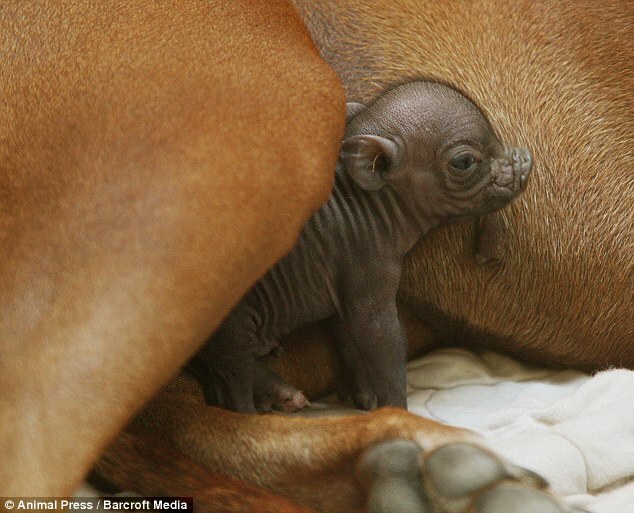 Property developer Roland found the weak and struggling piglet after she was abandoned by the rest of her family one evening after she was born. He said: "The pigs run wild on our land and the sow had given birth to a litter of five in our forest. "I found Paulinchen all alone and when I lifted her up she was really cold. "I felt sure some local foxes would have taken the little pig that very night so I took it into my house and gave her to Katjinga. "She had just finished with a litter of her own, who are now 10 months, so I thought there was a chance she might take on the duties of looking after her. "Katjinga is the best mother you can imagine. She immediately fell in love with the piggy. Straight away she started to clean it like it was one of her own puppies. 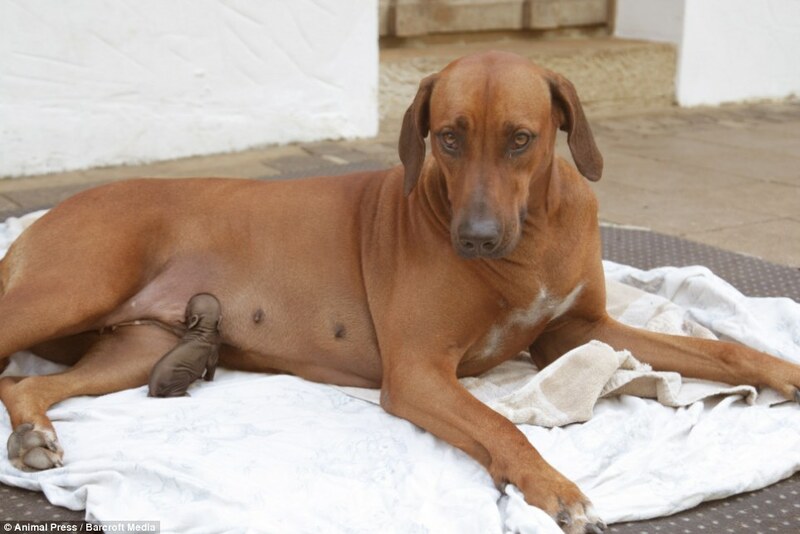 "Days later she started lactating again and giving milk for the piggy. She obviously regards it now as her own baby." Mum of the year? Quite possibly.